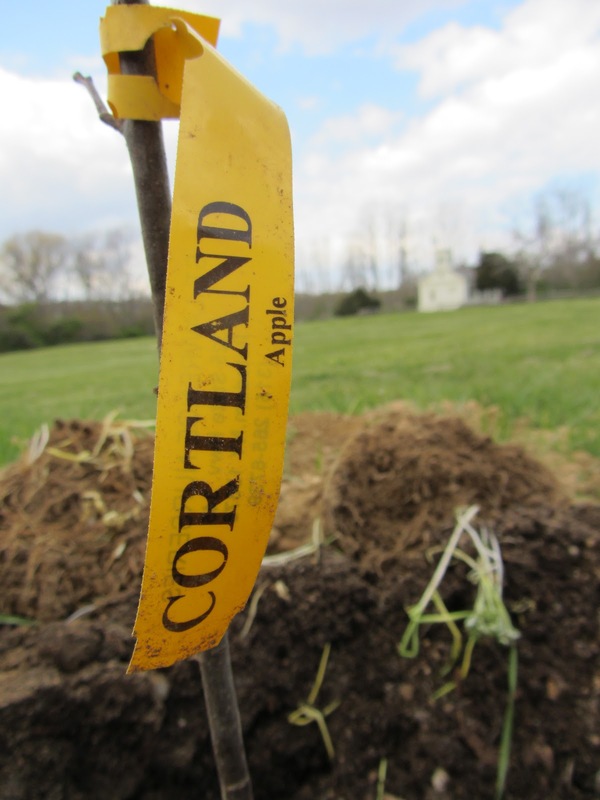 Along the northern edge of Chapel Field at Restoration Farm, a collection of new apple trees has recently been planted. The trees are young – mere twigs – but they have enormous potential. The line of eight trees is named “Apple Trace.” The word “trace” is not used too often in this context. It is a rustic descriptor, but seems appropriate for Restoration Farm and the purpose of these trees. A “trace” is defined as a visible mark, such as a footprint made or left by the passage of a person, animal or thing. It is evidence or an indication of the former presence or existence of something. There are some intriguing heirloom varieties found at Apple Trace. Ashmeade's Kernel was first grown from a seed planted by a physician named Dr. Ashmead in Gloucester, England at the turn of the 18th century. The fruit is eaten fresh or pressed for juice. Black Oxford can be traced to a seedling planted in Paris, Maine in 1790. The fruit is used for applesauce and baked desserts. Cortland was bred in 1898 in Geneva, New York and has a pure white flesh that is good for salads. Golden Russet is believed to have come from a mid-nineteenth century New York state seedling and is considered an excellent cider apple. Honeycrisp has a delicious crunch, and was developed in Minnesota in the 1960s. Newtown Pippin is a Long Island native, first grown as a seedling in Queens, New York and harvested in 1730. It was a favorite of George Washington and grown at Thomas Jefferson’s Monticello and works well in tarts and pies. Prairie Spy was developed in Minnesota and raised from seeds planted in 1914. It is a crisp, juicy, full-flavored eating apple. Winesap is an excellent storage apple and probably dates back to the 18th century. 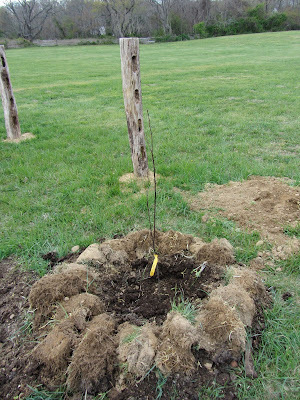 Apple Trace is planted in memory of my Dad, James M. Barritt, Jr. who passed away on January 10, 2012. My Dad loved apples and ate one every day for lunch. But, he also played an important part in my involvement at Restoration Farm. My Dad and Mom first brought my brothers and me to Old Bethpage Village Restoration when we were young and we would visit often as a family – long before Restoration Farm was cultivated on the same land. Once I became a member at the farm, we would visit together. One of my favorite photos of my parents is a picture taken at the Restoration Farm Summer Solstice potluck dinner in the field in 2010. It was a gorgeous summer afternoon and they look so happy. So my memories of my parents and my association with Restoration Farm are always entwined. It seems fitting that we plant Apple Trace to honor my Dad at a place where I still visit so frequently and where he once planted seeds of appreciation for history, the land and farming within me. I am grateful to head growers Caroline Fanning and Dan Holmes who were so supportive of this planting in memory of my father, and to Glenn Aldridge who planted many of the apple trees with such care. I look forward to the years to come when Apple Trace will bear fruit and my Dad’s spirit will be celebrated with beautiful apples shared with the community of members at Restoration Farm. What a beautiful story - I had no idea of your history with the farm. I'm sure you've already started thinking about how you'll use these different apples as the season progresses! I believe next weekend our farmers market returns - very exciting! What a lovely story about you and your dad. I love that the orchard was planted in his memory and what a fabulous way to honor him. As Zany said, I had no idea of your history with the farm. What a lovely post and thank you for sharing something so special with us. Such a loving story and tribute to your father. How happy he must be to see the trees planted in his name as he smiles down upon you and the farm. I have special memories of my father concerning the Winesap apple. There was an orchard behind his fathers house on the farm and it had many wonderful apple varieties but my favorite was the Winesap. In late fall we would pick them off the tree and sit beneth it and munch our apples. . .memories, wonderful memories. Blessings to you. What a lovely tribute to your father. My husband recently learned how to graft apples. We have a young apple tree that we planted in our backyard. This tree represents that we finally bought the house we rented for 7 years. We have six different varieties on one tree! We'll have to wait a bit for fruit, but it will be well worth the wait. There is no better way to pay tribute to someone special- this was a really special post. I understand your appreciation and history with Restoration Farm. T.W. that is a great story and what a wonderful tribute to your dad. I always thought trees were one of the best ways to honor someone's life. I envision a magnificent orchard one day standing tall at Restoration Farm where others too will feel the love of life, memories and delicious apples. First of all, please accept my condolences, T.W. And I was amazed to read your history with Restoration Farm! Why, you've been an integral part of that land for many years. What a fitting memorial for your father. NIce post tom! I wish I had read it before I stopped at the farm on Sunday. Caroline pointed out some of the progress and the new plantings this year. The line of trees was pointed out but it is nice to know the purpose behind their planting. Looking forward to seeing their growth! I did not expect such a touching post. This gesture, planting the trees, is such a thoughtful one to remember your dad by. I am sure he would have approved! Great story, moving even. This is a really sweet post. I did not expect to read about your dad's passing - condolences. Planting this tree is a continuation of of the journey that your father started. This is a neat tribute to your father. I love the idea of planting a tree in memory. It is such a beautiful gesture and as old as time. Back in the days when nature and man were knit closely together plants were honored more than they are now. Good to see that is coming around again. Loved the apple history too... can't wait to hear how you like them. What a lovely tribute to your father, T.W. What a wonderful and lasting memory that you have created. The varieties that were planted are all great. I have all of them in my orchard except for the Oxford and the Prairie Spy although I do have Northern Spy which is probably related. Dear T.W., I am sorry for your loss. It is such a longing and quiet that lingers with the loss of someone so dear. This is a fine remembrance of your Dad. I am sure that he is happy to know that these apples are being planted with him in mind. Thank you, my friends. I'm sure my Dad is smiling from your lovely words, and the thought of beautiful apples in years to come! Trees are a wonderful living memorial for us to remember our loved ones. We look forward to visiting Apple Trace on our next LI visit with our many happy memories of Uncle Jim.